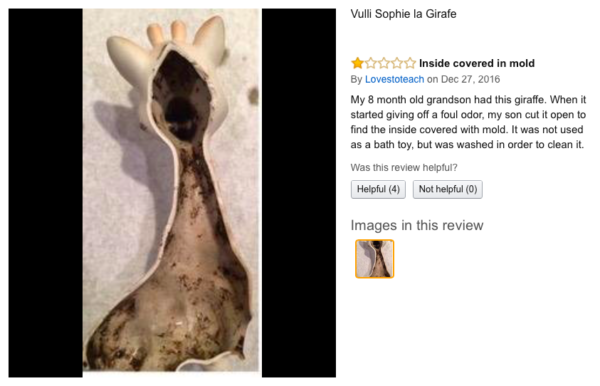 Is there mould growing inside your baby's Sophie The Giraffe teething toy? 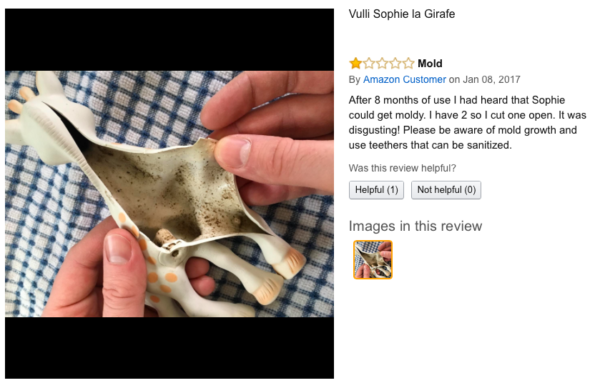 Is there mould growing inside your baby’s Sophie The Giraffe teething toy? 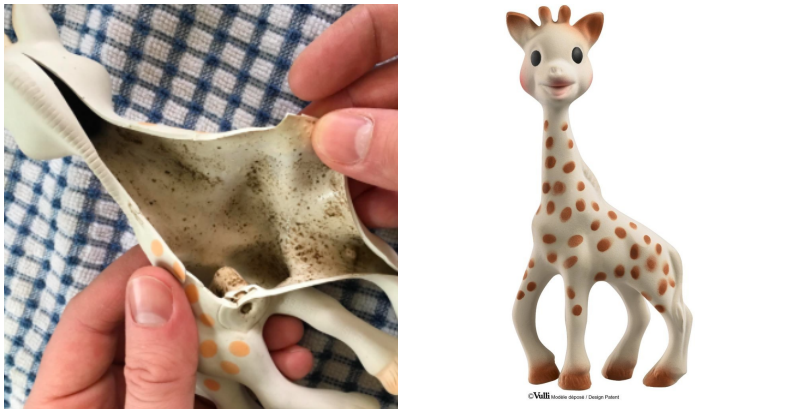 Wildly popular teething toy Sophie the Giraffe is in the news for all the wrong reasons, as parents reveal their babies’ toys are growing mould. Paediatric dentist and mum-of-two, Dana Chianese was apparently one of the first to raise the fungal alarm. After recommending the toy to the parents of many of the children she treats, she thought she’d dig a little deeper and was horrified by what she found. “I decided to cut into Sophie out of curiosity and discovered a science experiment living inside. Smelly, ugly mold living in my infant’s favorite chew toy!” Dana told Good Housekeeping Magazine. 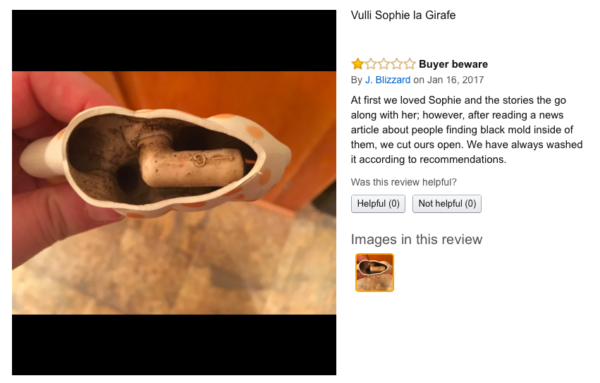 A bit of sleuthing across Amazon reviews show that Dana’s not the only one with a mouldy Sophie. Some types of mould can trigger allergic responses (runny noses, coughing, irritated eyes and skin) and it’s also known to trigger asthma attacks in some people, the NSW Government Health site says. Mould can also be dangerous to those with compromised immune systems. It seems that the main problem is that this toy requires constant cleaning – due to relentlessly being sucked or dropped by its adorable owner – and that it’s very difficult to keep the inside of it completely dry and moisture free. Sophie’s makers repeatedly stress that no “water” must get inside the toy. It’s hard to know how it would be possible to stop any liquid getting inside, if it’s designed to be gnawed on a baby, though. Despite the Sophie folk’s recommendations, parents on Amazon say they cleaned the toy as directed, and it grew mould anyway. You can see for yourself in the reviews below. 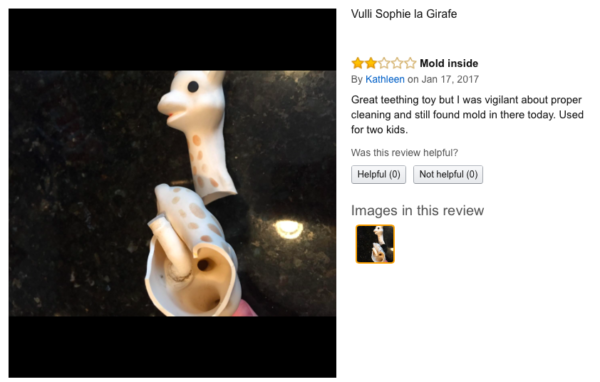 The people at Sophie the Giraffe have not mentioned the ‘mould’ explicitly in the face of this crisis, preferring to refer to the current Sophie concerns as a “situation”. They say they have not heard from dentist-mum Dana (who broke the news via Good Housekeeping mag), but will take any concerns very seriously. “Please know that each complaint received is taken very seriously and that the return of the product is always asked for further examination. Furthermore, please know that the safety of children and satisfaction of their parents is our main priority. For the past 55 years, we have always strived to exceed security standards and all of our products comply with the most stringent global standards,” spokeswoman Laurie Schraenen said. We’ll be following this story closely, and are keen to hear from readers on this topic. 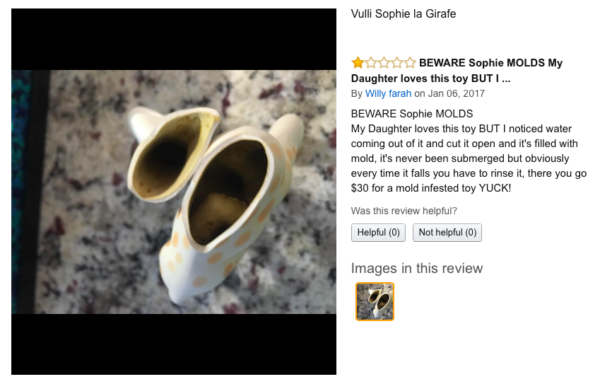 Have you had mould problems with your Sophie the Giraffe? Is there a “situation” at your place? How do you clean your Sophie? Is it even possible to keep the inside of Sophie dry?